Finally free agent Michael Owen has completed his move to Stoke City, signing a one-year deal with the club, subject to Premier League approval.. 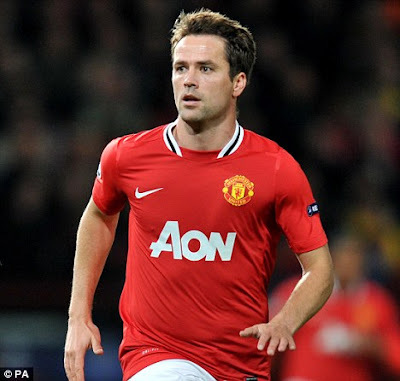 The 32-year-old has been without a club since he was released by Manchester United at the end of last season, and had been interesting former club Liverpool. A statement on the Potters' website said: 'Stoke City have today won the race to sign England international striker Michael Owen on a free transfer, subject to Premier League Board approval. Owen has endured a difficult five years ravaged by injury but boasts a record of 221 goals in 473 club appearances, which includes United, Liverpool, Real Madrid and Newcastle. He has also scored 40 goals in 89 England appearances, although hasn't featured for the Three Lions since March 2008. Owen is the seventh man to sign with Tony Pulis' side this summer, joining Jamie Ness, Geoff Cameron, Michael Kightly, Maurice Edu, Charlie Adam and Steven N’Zonzi.